“I’ve always admired RCTC, so coming here was an easy decision,” Davenport said. 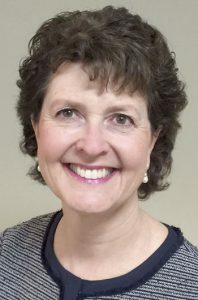 Davenport’s career with higher education and the Minnesota state system began in 1988 in Hibbing when she helped Hibbing Technical College, then a technical institute, make the transition to a collegiate level. In 1993, she directed a similar effort in Saint Paul as Tech Prep Program Manager under the Technical College System until this merged two years later with other state colleges and universities to become what is now the Minnesota State System. From there, she went on to oversee much of the system’s lobbying efforts in Washington, D.C., eventually becoming Director of Federal Government Relations. However, Davenport had always preferred more campus-oriented positions that brought her into contact with students. 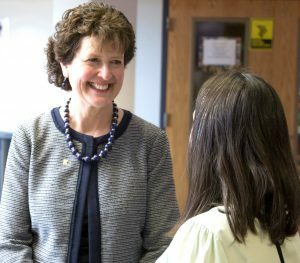 Finally in 2012, when the Minnesota State system came under Chancellor Steven Rosenstone’s leadership, she saw an opportunity to transition back to campuses. She got her reorientation with campus life at Saint Paul College as an interim dean and then a year later, took the position of Vice President at Riverland College before coming to RCTC on July 1, 2016, to serve a two-year term as interim president. After 30 years of experience in higher education, Dr. Mary Davenport’s favorite aspect of the job is still connecting with students. Just months away from retirement, Davenport said she looks forward to spending more time with her two daughters, both of whom are finishing higher degrees. She also joked that she looks forward to “living with her husband,” Richard Davenport, after 10 years of working 90 miles away from Mankato State University where he is president. Davenport feels confident that when her term ends in June, the search for a new president, which has been in progress for the past year, will bring forward the best match for the college. Although Davenport has always felt drawn to education, she originally planned to teach junior high school. Instead, her career took a hard left toward higher education, and looking back, she’s glad of the experience it brought her. But regardless of where her career eventually took her and in what roles she’s served over her 30 years with Minnesota higher education, Davenport’s heart has always been with the students.